Artist Hobie Porter is based on the northern NSW coast where the afternoon shadow of Mount Warning, a rocky remnant of a volcano, leans towards Australia’s most eastern tip, Cape Byron. Rocks and cliffs, now weathered and eroded, around Cape Byron were the result of volcanic laval flow 23 million years ago. Porter observes and experiences from within the natural world and also from without. He adopts an observer’s view of coastal scenes, with reliable horizon lines and the dependability of crashing waves. However he also orders his paintings in a structure of disjunction, where mathematical signifiers, having no obvious significance, turn or spin on an invisible pocket of air. In this way, the artist is inhabiting his own paintings with an eccentric uncanniness, with an evocation of his own self. His interest in the helix or multiple heli has increased in recent times. 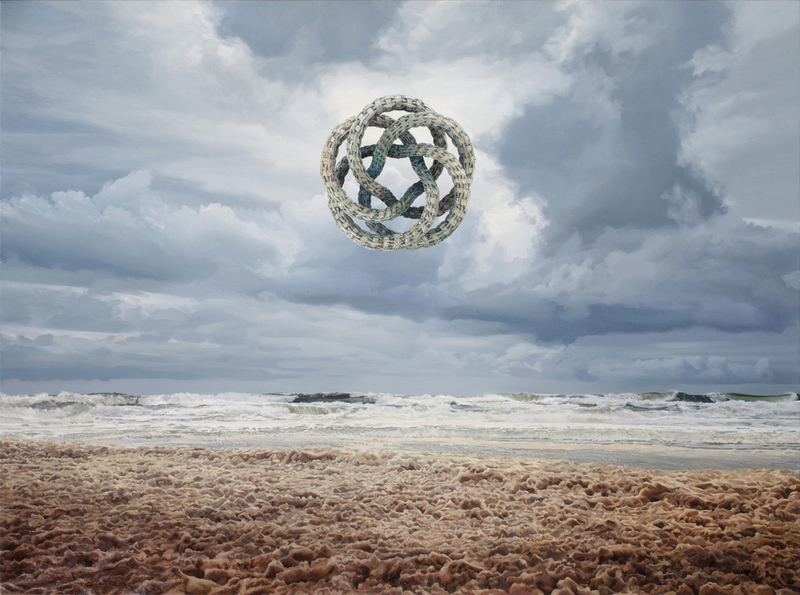 In Perpetuum 2012, his seaweed-hued ropes, entwined and gathering speed, inhabit this pocket of unreality in an otherwise hyper-natural rocky beach scene. The Romantic inclination of the rocky outcrop appears to reference painter Caspar David Friedrich’s Wanderer above the sea of fog 1818. Putting aside the context of art history for a moment, Porter allows us transportation. Permission is given to transcend the immediate and venture into his realm of self-similar fractals, split particles, everyday objects passing across light years. His objects within the painted object, which mostly hover above the breaking waves of the shoreline, are everyday flotsam and jetsam: woven ropes are his beacons. These turning motions, where sometimes the lengths of tori rope seem to be spinning in opposite directions, promise a strange underlying order, working against the decay, the flux and the temporal ruptures. The relation between viewer and artist is well-connected in Porter’s works. There is an incipient simpatico, a drawing in of the communal or the collective, despite the loneliness of the beach shore. 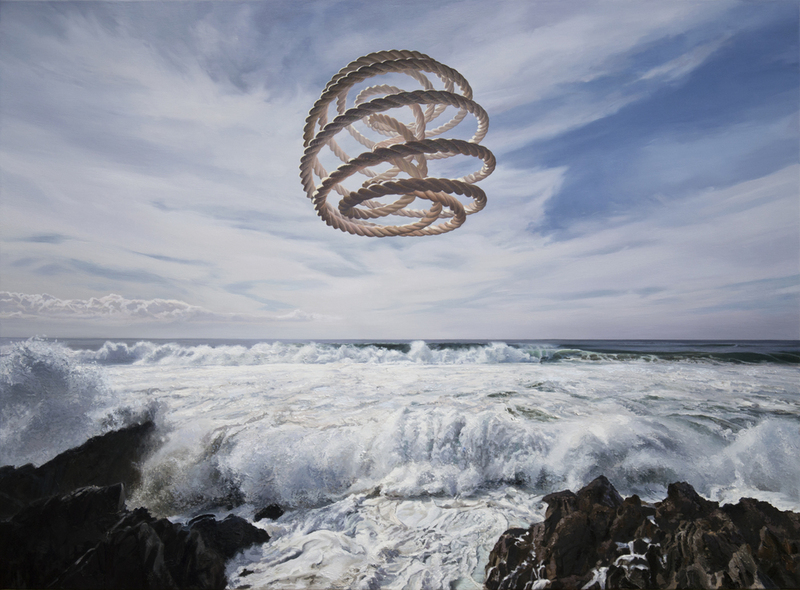 These paintings are just the beginning; they are taking form, growing and turning, like Porter’s rusty red rope in Threshold 2012 which hovers in front of breaking waves. We are allowed to enter the space of his scenes, perhaps because of the (suggested) motion of the turning objects. There is a scene in C.S.Lewis’ Voyage of the Dawn Treader where the children are lulled into thinking the seawater of a painting hung on the wall is beginning to move. The waves begin to surge and then the water spills over the picture frame and the children are transported into another realm, Narnia. This is the effect of Porter’s paintings on us. Back to history, the paintings can be contextualised in the great tradition of the sublime. This romantic vision where awe and wonder, curiosity and fascination with the vastness of the world or universe is easy to read in Porter’s work. However, Porter extends the associative force of transcendence through a contemplation of vastness, not just of space and place, but of time. So there is an intimate schism between what we know is not happening and what we know can happen. As Porter notes, ‘Deep time can be glimpsed via sublime feelings of wonderment, but conceptual descriptions always seem inadequate and brittle.’ This comment reflects a heartfelt, authentic and sincere desire to comprehend the incomprehensible, the infinite, the ‘more than this’. This is philosophical yearning, a longing to transgress protocols of everyday thinking, to transport the physical in nature into a series of endless queries about the in-between. Time is also particular in Porter’s paintings as his impermanent objects decay, corrode and fade. We are lured into thinking these physical paintings are more certain than the world around us. Yet of course the paintings are made of natural matter and will decay, in time, as will we. Who will linger longer: calcified manufactured rope or humans. Perhaps it is because of the harrowing toll Nature has taken through flood, drought and cyclone disasters that we tend to perceive Nature anthropomorphically. In awe of her mighty power, we weep our sorrowful lament over what has happened to her pristine shores, her unfathomable depths. The final piece to Porter’s puzzle is his unambiguous curiosity in geometry. The universal appeal of the artist’s ‘primal circle form’ suggests uniformity, collective safety and strength, a motif of endlessness or, conversely, of nothing. His use of the helical torus, single or multiple intertwining strands, can be read as the intricate patterning of nature within which humanity’s story is intrinsically linked, passing in opposite directions. Past and future, good and bad, nature and culture, man and the world: these seemingly dualistic opposites are in fact connective. When you look at Porter’s paintings, make sure to keep your two feet firmly planted on the ground, or hold fast to a friend, for there is the real possibility you will topple forwards into the sublime ‘everything and nothing’ he has written into each painting.